The sixth session of the Sixth National Assembly convened on 26 November 2018 at the National Assembly (Main 6). President of the National Assembly Standing Committee of the National Assembly (NA) and the members of the National Assembly (NA) attended the election. The government can acquire money from other sources for injecting into small and medium-sized enterprises (SMEs) rather than issuing loans, which would only add to the country’s debt. The Lao Cai border economic zone will be developed into an industrial, urban, trade and service hub, serving as a driving force for the growth of the northern mountainous province of Lao Cai, according to the zone’s master plan. A bridge that has been built across the Nam Ngum river linking Nabong and Thakokhay villages in Pakngum district, Vientiane, is now open for public use, making life easier for local residents. Refugees returning from the country are experiencing difficulties in their new home. In the newly built village of Lekkae, in eastern Burma, the refugee immigrants The backwardness of the country is experiencing difficulties in adapting to the situation after a conflict and dwindling. Escape for more than six decades. An exhibition as part of activities to mark the 50th anniversary of the liberation forces’ command centre in Viengxay district, Huaphan province, opened on Monday at the President Kaysone Phomvihane Memorial in Xaysettha district, Vientiane. The Lao PDR Centre for Malaria, Parasitology, and Entomology’s (CMPE) 2016-2020 National Strategy to control and eliminate malaria, the fifth such strategy to eliminate malaria in Lao PDR, aims to eliminate and control malaria in northern and southern provinces where malaria can be found. The Association of Traditional Indian Orthodox Monks celebrates the Hindu. A bridge spanning the Nam Ngum River between Nabong and Thakokhai villages in Pak Ngum district, Vientiane Capital has been handed over to local authorities. The year 2018 is the year the Lao PDR has been hit by a severe natural disaster (flood), with 124 districts, 2,382 villages, 126,619 families, 616,477 deaths, 60 people. Laos has secured a grant from the United Nations Central Emergency Response Fund to support emergency response and humanitarian efforts in the aftermath of the recent floods that occurred across the country. Samlane Jewellery Shop marked its 30th anniversary in Vientiane Capital on Nov 23 with customers rewarded prizes worth more than 150 million kip, approximately US$ 17,570. 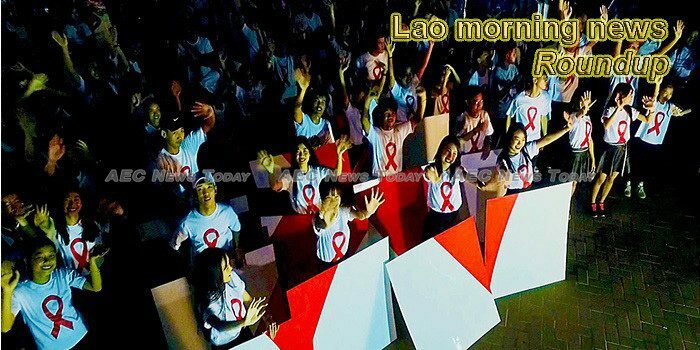 This week’s Lao morning news feature photo acknowledges International Day for the Abolition of Slavery, December 2.